Everything Changes – The Guide to Young Adult Cancer » Can’t Sleep At Night? I keep waking up at 4:48 AM. Sometimes a few minutes earlier or later. I hate it. But I know I’m not alone. I’ve talked with a handful of breast cancer bloggers this week and discovered we all use blogging as a great way to deal with being awake at night. Sometimes I can clearly identify what is keeping me awake: a doctor’s appointment or test on the horizon. Sometimes even good events: my excitement a few weeks ago about being interviewed as a young cancer patient on Fresh Air with Terry Gross (she is my #1 role model/heroine.) But, often I’m just up for reasons I can’t figure out and I don’t particularly feel like scavenging the back of my mind to find the answer. When I’m up, I get out of bed, go to my laptop, and work. Lately it’s the only thing that distracts me – even when I lay in bed reading, my anxious thoughts take over the words on the page. But, there must be a more peaceful middle ground in the hush of my night between tossing and turning and slamming into work mode. People with weakened immune systems seem to need sleep the most, but the very nature of us being sick is often what grates on our minds keeping us awake. A recently published article in the Archives of Internal Medical shows that people getting fewer than seven hours of less have less resistance to cold viruses than people getting eight hours or more. Do you ever have a hard time sleeping? Is it better or worse at certain times? What do you do when you are awake at night? How does it affect your life? 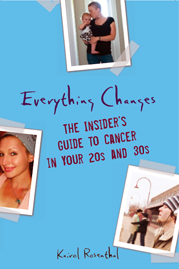 Read Everything Chanages: The Insider’s Guide to Cancer in Your 20s and 30s to learn about the about profound thoughts that other young adult cancer patients have when they are up at night. I recently had trouble sleeping, it was after I bumped my head. I think that I was afraid I’d die in my sleep or something like that. There have been other times too, while waiting for test results too. I t makes me crazy sometimes how long doctors have you wait for test results. This is just normal blood work, and stuff like that, not cancer related. You know I have trouble sleep as you are one of my late night friends that I talk to. I am not sure what is causing the trouble sleeping. I am in end stage ovarian cancer and find my body desperatley needs sleep. When I can’t sleep I find that my anxiety increases and I tend to have meltdowns. Anything that was plaguing my thoughts during the day are amplified. I also tend to feel very alone. I know I have lots of friends that are supportive, but I am single and really feel alone at night. I am already taking sleeping pills, but have found it no longer works to helping me getting to sleep. I have found that chamomile tea and a warm bath can help me get some sleep. I always have trouble sleeping. I attribute it a lot to the chronic pain that is one of those great fun late effects of my cancer treatments, but sometimes even if a hot bath or the ultra-rare massage helps to ease the pain, I still cannot sleep. I’ve been working on it for quite some time with the doctors, but nothing helps. I am so with you on this, Kairol, including not wanting to call it “insomnia” – it feels somehow disrespectful when sleeplessness is intermittent. And like you, I use the sleepless hours to write. One night (morning) when I was still up at 5 am (finally got myself out of bed at 3:30, after awakening at about 2 am) I realized that I had done some work I was really proud of. When I called a friend to share that later on that day, she said she’d been up at that hour too! I wish you had a gmail address so I’d know when you’re online in the middle of the night. It would be fun to have a “lonely hours” club. I bet they exist already. Sleep…I do sleep sometimes but my schedule is off from the rest of the world. So like we discussed, now I blog…. Two weeks ago I just had my second surgery, reconstruction of both breasts. Sleep was immediately disturbed (more than it already was) and I was immediately moody and irritable. I find that pain wakes me up. After my first surgery I didn’t have to set the alarm to take my pills, my body woke me up. For awhile I just got used to being up every 3 or 4 hours, but that was not the worst part. I tried not to think when I woke up at 2 am, but my brain would immediately go into chatter mode and I’d be up until 6! Being a usual sound sleeper this really bugged me. But I couldn’t take sleeping pills, they messed me up. When I was able to do more exercise I started sleeping more. And when the pain became less I slept for longer chunks of time. I don’t know if you have an exercise routine, but I find that 15 minutes of slow pedaling on my stationary bike relaxes my muscles and quiets my brain. Apparently it was quite unnatural to sleep a solid 7 or 8 hours and then be up and on your way, it was more typical to sleep for a few hours when the mood struck after dusk and then wake up in the middle of the night to do chores and then to sleep some more. And it makes sense when you think about it – in the fall and winter it gets dark around 6 or 7pm and light at about 6 or 7am. After I had my surgery I found myself waking up in the middle of the night, but since I did not have to get up in the morning I didn’t fret about it – in hind sight I wish I’d given myself permission to nap more during the day, but it was so novel to just be able to lie around and visit with the friends who came to visit that I neglected that. I still have fatigue a year later. Since I read about this age old habit of sleeping waking working sleeping I’ve been able to fret less about doing this myself. (at least one thing off my plate) I just have to remember to allow myself to go to be early. I’m likely to be waking up later anyway (not like I’m going to be churning butter or darning socks …) TV is certainly a villain here. I’ve been taking a woodworking class and for some reason I sleep really well after each class. I don’t know if it’s the exercise, the community, or the lack of the tube, but it works for me.